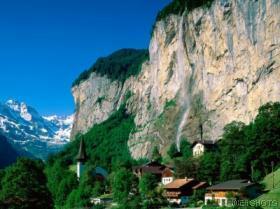 Hi All, So we left paris and went to Lauterbrunnen in the Swiss Alps....an absolute stunning place to say the least!! Two massive cliffs either side of our campsite with snow capped peaks while we were walking around in singlet, shorts and thongs. Went out two out of three nights to a place called the bomb shelter...it is a place of carnage (two contiki buses, two busabout buses anda topdeck buses converge on one single place/bar...absolute debauchery comes to mind :) But while we were there managed to do white water rafting and canyoning...(canyoning is essneitally start at the top of a canyon and make your way down by jumping of rocks into pools of water (some jumps were about 3m high and you land in about 3 ft of water even less and to make things worse you have to jump out far enough so not to hit your head on the rock but not to far to esnure you don't hit the other rock wall...It was awesome fun but also pretty expensive (about $120 each) but well worth it!! !